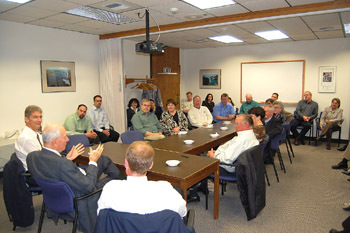 On the afternoon of May 3, 2010, the Washington Division hosted its third annual Retiree Ice Cream Social. As part of this event, the Division invited Mr. Alan Boyd, the first USDOT Secretary, to speak. Mr. Boyd currently lives in Seattle and late last year spoke to a group of Seattle area USDOT Federal Executives at one of their quarterly meetings. He made quite an impression and hence was invited down to Olympia to address the Division and its retirees. Secretary Boyd addressing retirees and employees. Mr. Boyd, in his warm and friendly manner, enthusiastically talked about the formation of the DOT, some of the political figures of the day, and his views on transportation. According to Mr. Boyd, the origin of the DOT was to foster communication between the modes. Previously, oversight of transportation was spread throughout many Government Agencies and different modes were stove-piped and never spoke to one another. He gave an example where, in the early days of Interstate construction, an Interstate in Omaha, NE was being constructed 6 miles from a new International airport without any consideration of connecting the airport and roadway. He also talked about the historical inter-relationship between the railroad and trucking industries. So the three main reasons for creating the DOT were: improving safety, coordination among Agencies, and protection of the environment. It was interesting to note that most of the themes that were relevant in 1967 are still important to us today; protection of the environment, civil liberties/rights, highway safety, and good communication/coordination. 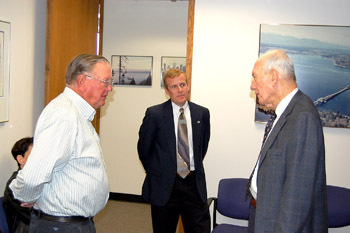 From left to right: Former Assistant Division Administrator Harry Bennetts, current Assistant Division Administrator Mike Canavan, and Former U.S. DOT Secretary Boyd. Mr. Boyd provided insight on the development of the environmental process and how building roads in the early days did not consider the social and environmental impacts of a project. He stated on several occasions where new highways became like a "great wall of China" in a community, dividing neighborhoods. Regarding the environment, he noted that cases like Overton Park in Memphis led to the National Environmental Policy Act (NEPA). He pointed out a common criticism of engineers; to go straight through neighborhoods, parks, cemeteries, etcetera, encouraging all of us to think broader. Mr. Boyd used the Overton Park case as an example where we needed to have rules in place to protect the environment and consider the communities served by transportation projects. He seemed concerned about optimizing what we have, getting people out of their cars, and making our communities more functional and "livable." He felt that transportation in and around cities needed to be improved so that services could be provided in a more efficient manner. He talked about how the development of suburbs forced people into their cars which made transit and other services more difficult to provide. He said, "We've got to figure out how to move people in and out without killing the cities." Mr. Boyd also talked about civil liberties/rights. He described how a man he met with years ago purchased a house for $19K, sent his daughter to college, and 20 years later the DOT built a highway though his neighborhood and offered him $19K for the house with no consideration for the accrued value. The gentleman conveyed to Mr. Boyd that he played by the rules and was taken advantage of by the Government. Mr. Boyd was trying to emphasize the need for laws/rules in place to protect people. That conversation led Mr. Boyd to discussing Lyndon Baines Johnson (LBJ). He stated that LBJ was a champion for Civil Rights. LBJ believed that if the private sector could not provide decent housing, education, and jobs for folks, the Government should step in. Mr. Boyd stated that LBJ spent a lot of his political capital in pushing the Civil Rights Act through in 1964 and how he thought that without LBJ's efforts it would have never happened. He recounted his conversations with LBJ who he said was a good listener who remembered things years later when others forgot. Mr. Boyd also noted that LBJ could be as "mean as a rat snake," but the next day he'd bring flowers and would apologize profusely. Mr. Boyd talked briefly about highway safety and the improvement of highway geometrics. He also marveled at recent improvements to automobiles. In addition, when asked about authorization and funding, Mr. Boyd indicated he believed transportation funding should be considered along with other Federal priorities and, therefore, it should come out of the general fund. 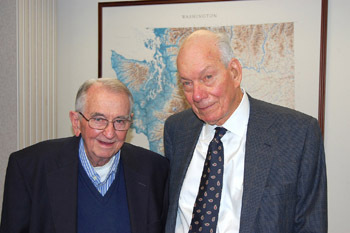 Former Division Administrator Paul Gregson (left) and former Secretary Alan Boyd. Mr. Boyd particularly seemed to connect with the former Division Administrator Paul Gregson (1975-1988). Mr. Gregson stated that he was with the Bureau of Public Roads (BPR) in Little Rock when the USDOT was formed (1967). Events such as these are a wonderful opportunity for staff, retirees, and honorees to share their experiences. It was an honor to have former Secretary Boyd visit our office, and the Division staff and retirees enjoyed meeting such a significant witness to and player in transportation in general and DOT's history in specific.